•100% Premium High Density bonded rebond . • Anti-microbial and non-allergenic "microfresh". • Child and Pet resistant to protect carpet longer. • Reduces noise levels and enhances insulation value while reducing energy costs. 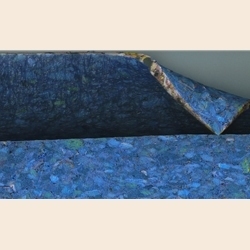 • Two-sided moisture barrier to protect the carpet and cushion. • Double barrier protection resists spills and accidents bleeding through or seeping through. • Perfect for stairs and hallways. • Guaranteed for the life of your carpet.